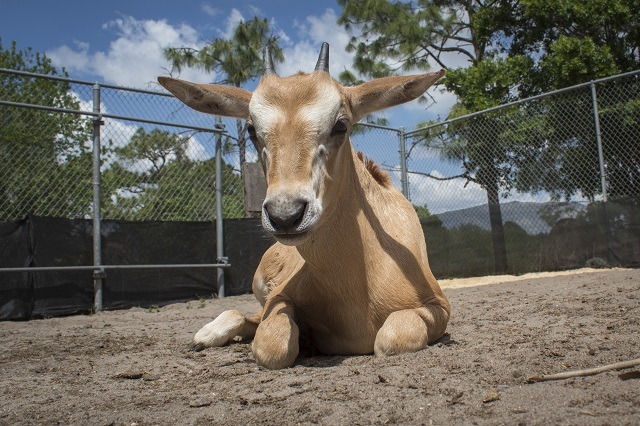 MELBOURNE, Florida — On Tuesday, February 28, the Brevard Zoo welcomed its second scimitar-horned oryx calf of the year. Zoo officials say that the first-time mother, Kitcha, did not appear interested in the female newborn, so she is being hand-reared by the Zoo’s animal care staff. Tests performed the day after the birth showed that the calf had not yet nursed, so Brevard Zoo staff decided to pull her from the exhibit. She is living in an area where she can see and smell the rest of the herd. The calf's mother was born at the Zoo in 2009. The father, Nuri, came from Smithsonian’s National Zoo and now lives at Lion Country Safari. Nuri also fathered a male calf born on February 3rd. Scimitar-horned oryx were once one of the most prominent mammal species across northern Africa, extending from Morocco to Egypt and as far south as Sudan. In 1999, they became extinct in the wild as a result of increased hunting for its horns. The species is now successfully bred in human care and a healthy population of captive-born oryx has been reintroduced to their native range.